Today is Sunday Selfie Blog Hop with The Cat On My Head but it’s EASTER SUNDAY so we dressed our selfie up for the occasion. 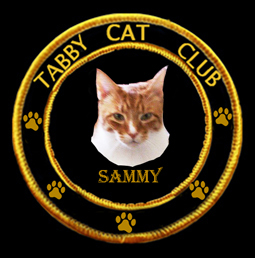 If you’d like to join in the Hop, click on their badge below my selfie and use the LINKY tool and you’re IN! 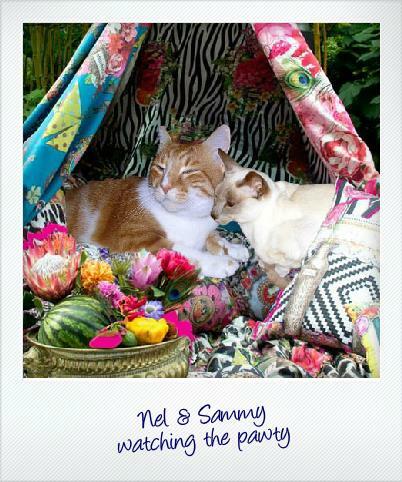 And even though this is the first Easter without Sammy in the house, we honor him with one of his Easter poses…….we miss you Angel Sammy! and if you want a giggle check this out! On this beautiful Easter morning we have just learned that the Queen – Nellie – has left for the Bridge. 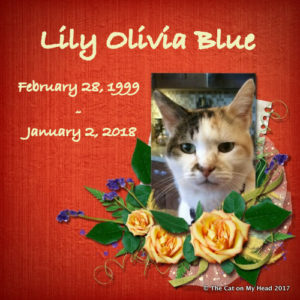 My brother Angel Sammy and so many other friends welcomed her there with open wings and hearts………and she is at last dancing through the clouds. Forever hugs sweet Nellie……….. 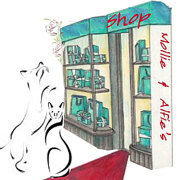 If you click the badge it will take you to Nellie’s blog and you can leave a comment………..
Let’s Fill In Some Sentences! 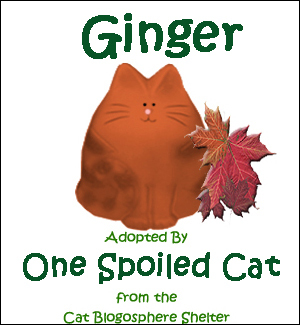 Friday means joining one of our favorite Blog Hops – Friendly Fill-Ins which is co-hosted by Miss Ellen of 15andMeowing and Miss Ann of McGuffy’s Reader. All you have to do is fill-in the sentences they give us…………….two sentences are from Ellen and two from Ann and that’s all there is to it other than clicking the above badge and going to McGuffy’s Reader and using the LINKY tool to sign up your blog! Easy right? This week we have let Teddy do the filling in………kind of scary to give that much power to a kitten but we thought it might be fun so here goes. Teddy’s fill-ins are in RED! 1. An Easter (or Passover) tradition I have is (will be) getting an Easter Basket from my Mom and Dad! Angel Sammy said he always did so I hope that’s a new tradition for ME! 2. My favorite flavor of ice cream is Vanilla – of course something ELSE might be a favorite but so far I’ve only had vanilla from my Mom – I’m willing to give others a try though!. 3. One of my favourite Easter/Passover memories is Nothing since this is my first Easter so I’ll let my Mom answer this one. Hello everyone – this is “Mom” and one of my favorite Easter memories was when I was a little girl and we lived in Weisbaden, Germany. Our housekeeper was a lovely German lady and she brought my brother and me a very special German Easter egg full of tiny, very sweet little special candies. Funny because I’ve had many Easter baskets since and all kinds of candies and goodies but I remember HERS over all the others. 4. My favourite Spring flower is Dicentra – it’s the only flower I know – they are blooming in Mom’s garden and I love the little hearts!! So there you have it! That’s the last Fill-In before Easter so in case we don’t have a chance to say this again before Easter Sunday……………..HAVE A BLESSED EASTER OR PASSOVER! First part of my blog today is for THANKFUL THURSDAY. Today I’m VERY thankful – Why? Many things but today I’ll tell you just one reason – Spring is popping here finally. As recently as one week ago we had a frost/freeze warning but for the last several days we’ve had WARM temps and the little leaf buds on the trees are bursting open in leaps and bounds! Our pink dogwoods have pink blossoms and the little dwarf Japanese maple has leafed out – the maple was my FAVORITE spot to stay cool in the summer and we think Teddy has figured that out now too! Want to share what you are thankful about? We are sharing by joining Brian’s THANKFUL THURSDAY blog hop………..all you have to do is click the badge, go to his blog, use the LINKY TOOL and enter your blog address – SHARE with all of us what you’re thankful for. EASY! Now for PART TWO of this post and that’s my Thoroughly Poetic Thursday post……………….this week we are up to the letter “R” in the alphabet so the poem needs to be about an “R” thing! Watching out for the Easter rabbit! He’s QUIET as a mouse! To see how many eggs can be found! For carrying around all your treasures…. Such fun is impossible to measure. Makes older folks feel like a child. Without those visiting RABBIT feet!! Next Thursday we will celebrate the letter “S” as we make our way to the end of the alphabet for the second time here on the blog! 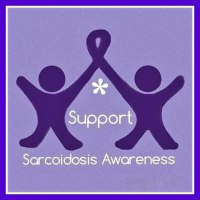 I hope you will join us – it’s not too late to join in today – you can write a poem and put it in my comments OR if you have a poem done on your blog – leave us your link so we can HOP over and read it! Try some poetry – you’ll be glad you did!! 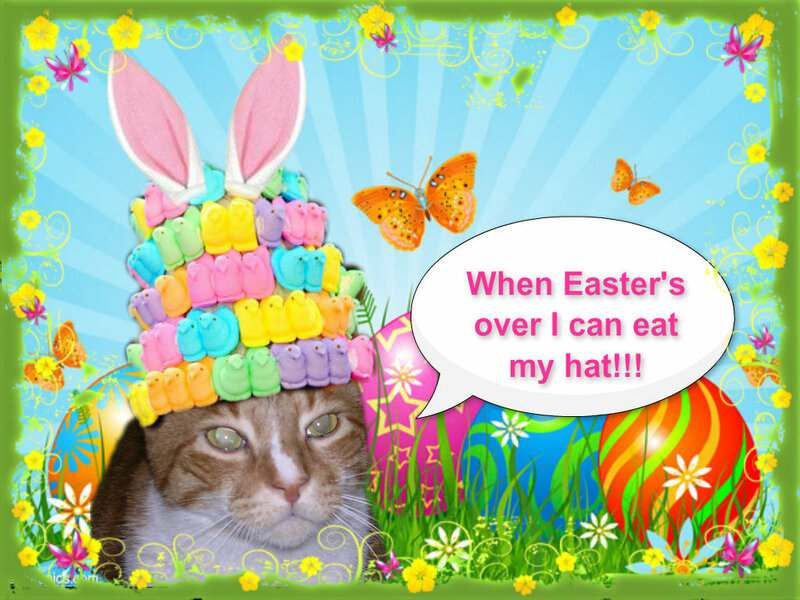 We are joining up with The Cat On My Head’s Selfie Blog Hop which today I’m calling a Bunny HOP! 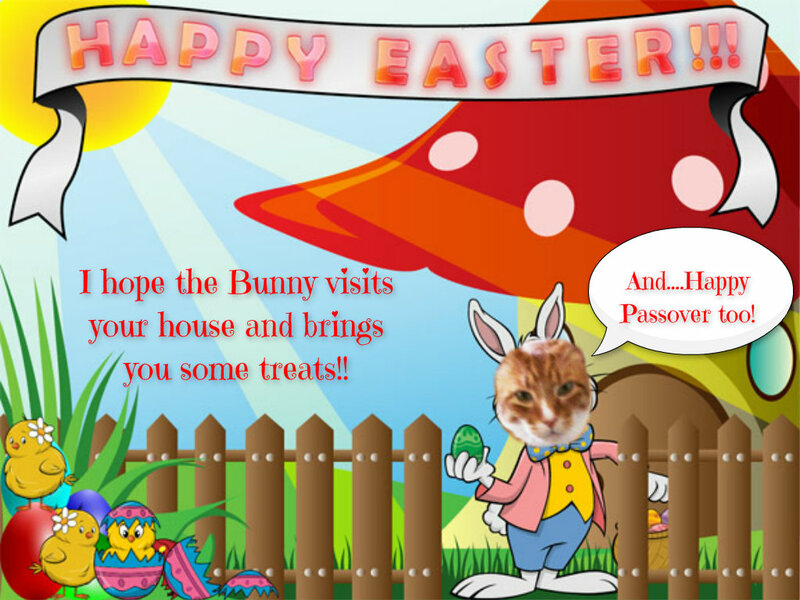 Just click on their badge to visit and see other bunnies critters showing off their Easter finery and wishing everyone what I’m wishing YOU – that you have a wonderful Easter Sunday! Click Below to see more Selfies or join the HOP! May you have a joyous Easter celebration…….! Anyway, Mom and Dad have a couple of things to do this morning that will put cleaning on hold briefly – Dad is going in to sign the tax forms which are done AND Mom is dropping off the PC in the computer shop for the new CD/DVD drive installation! This time I won’t be missing for DAYS – we have the new laptop so life will go on in the Kimmell household even though the PC is in the shop! Yesterday was an amazing day – we really did have a touch of REAL LIFE SPRING. I know it won’t last – it’s too early for it to last – but it was just plain GORGEOUS. Seventy-four and sunny and Mom got the lawn tractor out for the first time and did a turn around the yard. The lawn looks like “****” (if you get my drift), but there were some long tufts of “sort of” grass and a lot of leaves and now it’s at least cleaned up! GO MOM! She loves riding that thing – I was waiting for her when she came back inside all dust covered from the dry dirty back yard where she probably shouldn’t have driven but did. So – Spring is arriving. Our Bradford pears are blooming – that’s a sure sign there is HOPE! As soon as there’s something pretty to show I will but right now – it’s still pretty BARREN out there. Too early for azaleas but never too early for sidewalk cruising! 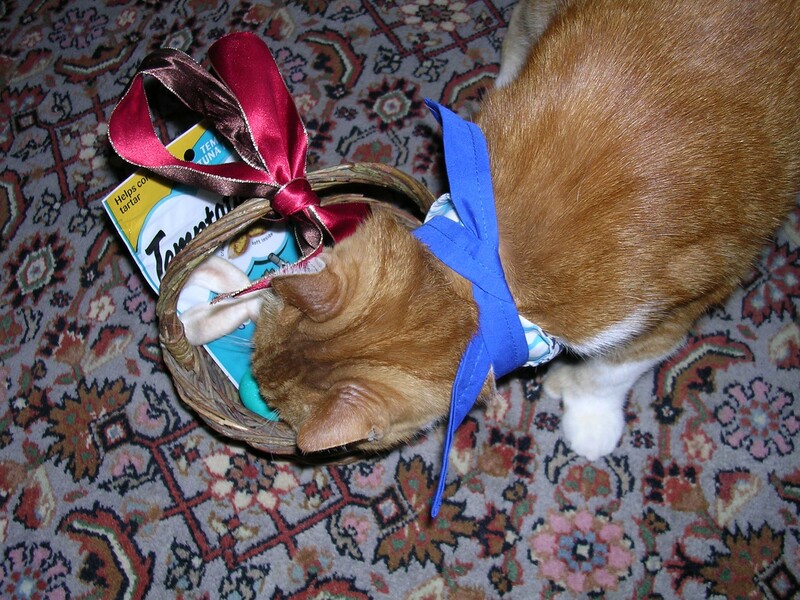 I’m ready for the Easter bunny…………………..he never lets me down – just like Santa – always on time and always makes me smile……………………he recycles my basket – has used the same basket for 16 years now. But there’s always something FUN in it on Easter morning – not a boring old egg!! 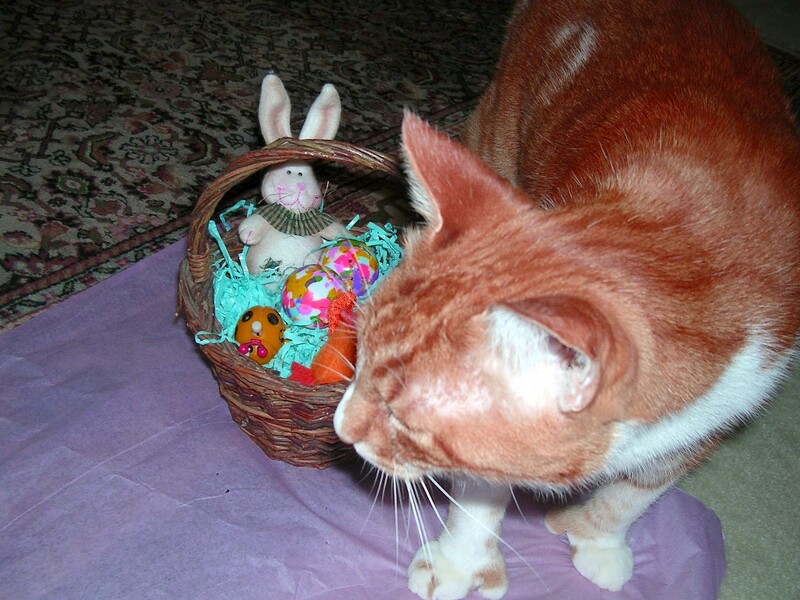 Don’t ask me where my 2014 basket is………Mom forgets to name photos LOGICALLY sometimes! 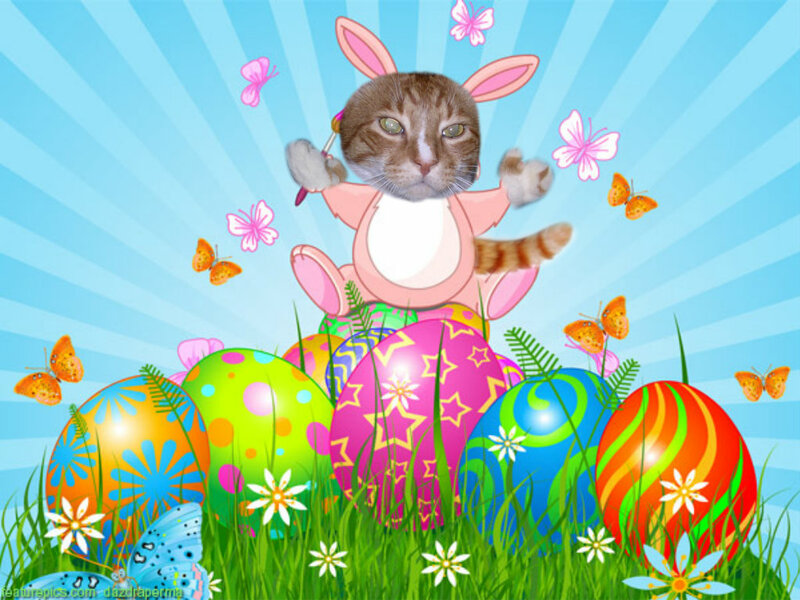 Anyway, I hope you’re ready for Easter if you celebrate it………………………..I’m just READY FOR BACON tomorrow! I’ll also be BRAVE when the cleaning starts today – honest I will! Pee Ess The waiting is now over – the vet called before this post went live so I can report that I have to UP my dose of thyroid meds (whaaa) – two whole pills a day vs. 1-1/2 pills a day. I’ll do my best…..after all, Mom gives me my pill in baby food which is pretty nommy so maybe it won’t be so bad….maybe. To You and Your Peeps! Click their badge to visit! with a lot of help from my “Besties” ????? guess who “allowed” someone into his private basement hideaway recently??? 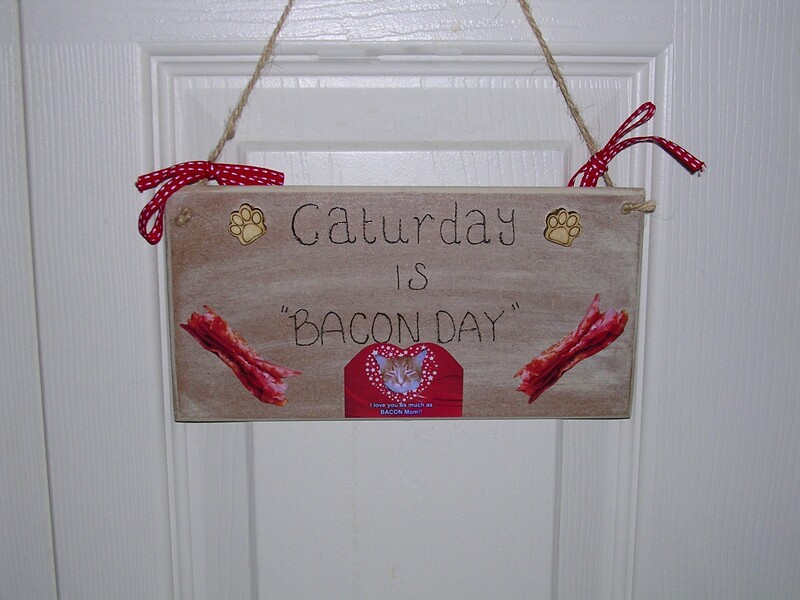 Oh I’m so happy it’s here – bacon day………………and I’ll be shameless when I ask for it – trust me on that one…………….here comes my favorite posters!!!!! 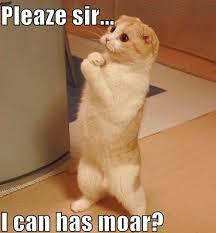 I don’t have to resort to this behavior to get my bacon fix either! Mom has also promised that we will have bacon tomorrow on Easter morning too – along with fresh blueberry pancakes (I’m not that hot on pancakes but my Dad sure is!! )………..then later in the day will be DUCK……………..I’m told by all of you that I will love it. Believe me when I say I’ll be blogging about it on Monday for sure……………. In case some of you are out of town tomorrow – I’m giving you your Easter card from me NOW……………………please know that I love you all and hope you have a grand weekend whether you’re celebrating Easter or just “A WEEKEND” !!! Oh boy – the Easter Bunny is coming to my house – he’s never let me down in all my 15 years so I’m expecting him to show up on Sunday as always. He brings me a basket – it’s a little one – “Sammysized” of course for ME. Below are three of my past baskets! But that’s not nearly as much fun as watching my Dad hunt for Easter eggs. Tee Hee…………that’s right – Mom and Dad color Easter eggs every year and Mom hides them in the house for Dad to find. Sometimes I cheat and show him where one of the eggs is (because I’ve followed Mom around when she’s hidden them!). He calls me his “Bunny Buddy” because I help. We think we’ll have a pretty day on Easter Sunday. Mom and Dad will fix a big fat meal too – this year Dad won the right to choose Easter dinner and while we USUALLY have turkey, we’re having DUCK this year. I wonder if I’ll like it? I’ve never had it before – Dad loves duck – Mom does NOT so that means there will be a lot of it around here!! I’m willing to give it a whirl! OOPS – NOT THIS DUCK OF COURSE! We’ll also be hiding Easter eggs out in the yard for our neighbor’s little boys. We did that last year – the plastic eggs with little goodies in side and one brother gets his hidden in our front yard and the other gets his hidden in the back yard and they see who can find all of theirs FIRST! So see why I’m excited about Easter? SO much going on…………….ducks, bunnies, eggs, baskets – and in the middle of all of that, Mom says we should remember what Easter is REALLY about. Of course we will……….ALWAYS. Whew! Did Easter exhaust you as much as it did me? Well, we were pretty busy around here and while it was all FUN and the Bunny brought treats, my parents were on the go and I didn’t get a lot of time with them. I’m glad it’s Monday. Time for some catching up. 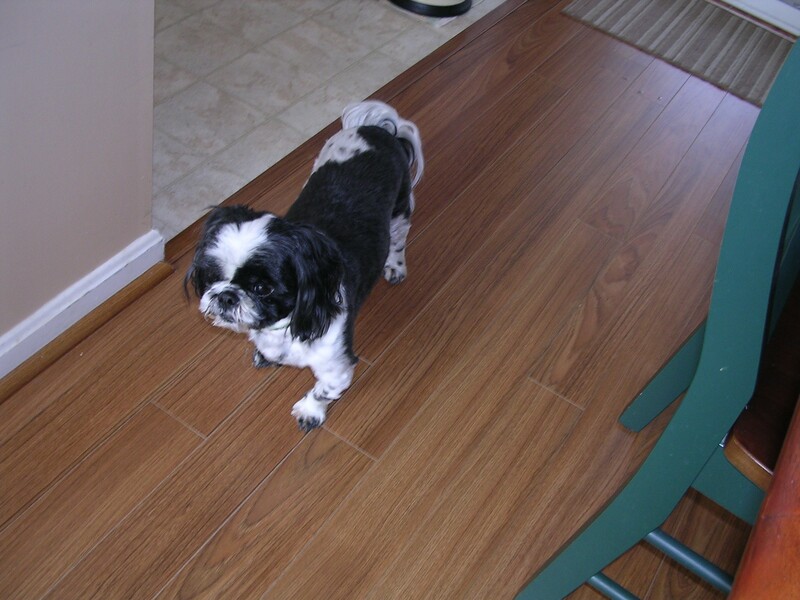 First I have a few pix from my Mom’s trip to visit her sister – my Auntie Carol – last week and I wanted to show you my Cousins……Shih Tsus Mollye, and Toby. 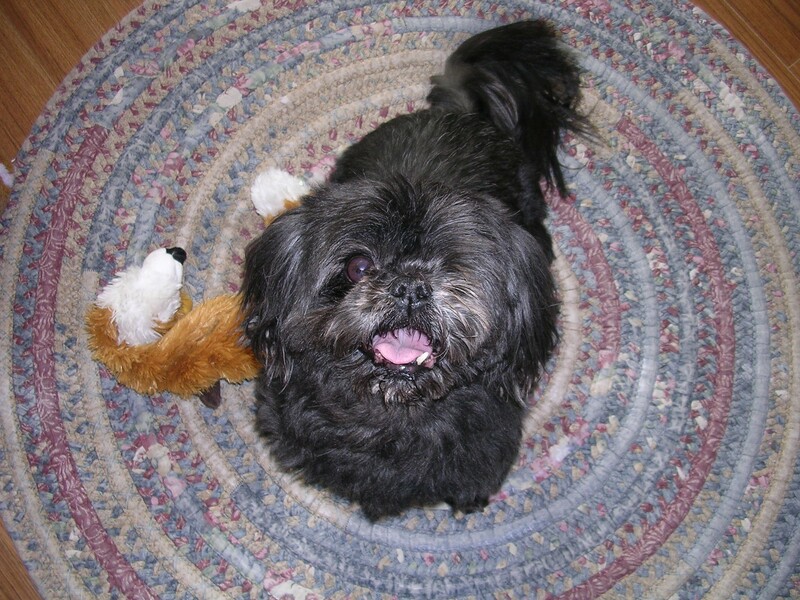 Mollye only has one eye because when my Aunt rescued her, she’d been a puppy mill Mommy all her life and had no vet care…..she had glaucoma very bad in one eye and also never had dental care so Aunt Carol had her work cut out for her but Mollye is one great big sweetie love bug. She has problems ambulating because she was kept in a cage all her life just having puppies so her little legs had quite an adjustment to make when she could run and walk like a normal pup! Anyway, she’s doing just fine………and her big brother Toby takes good care of his sister! They are great friends and very close. Guess that’s about it for me for a Monday………………..see you tomorrow??? 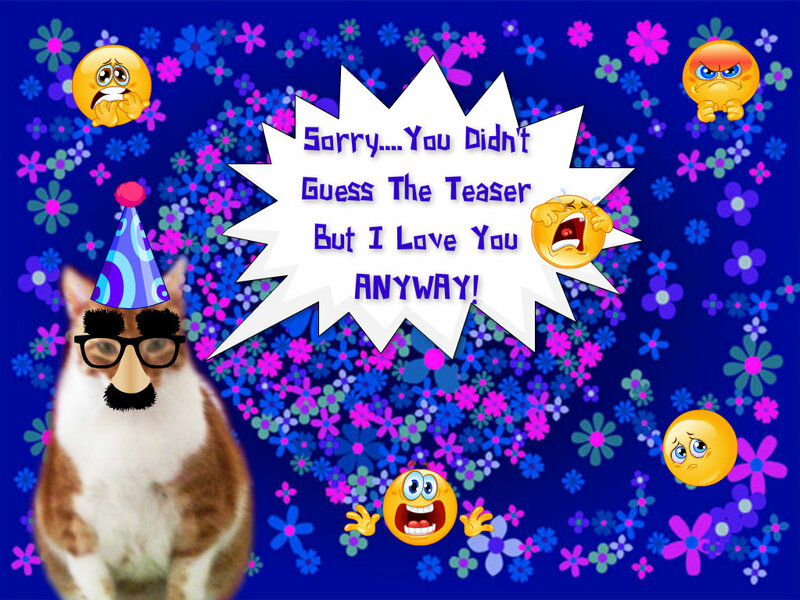 The Teaser will be waiting for you………..and you know you don’t want to miss that!! Easter – yep – it’s not all that far away and I’m starting to work on getting ready for that…………..are you? I had to find the perfect outfit and I think MAYBE I found it – what do you think???? 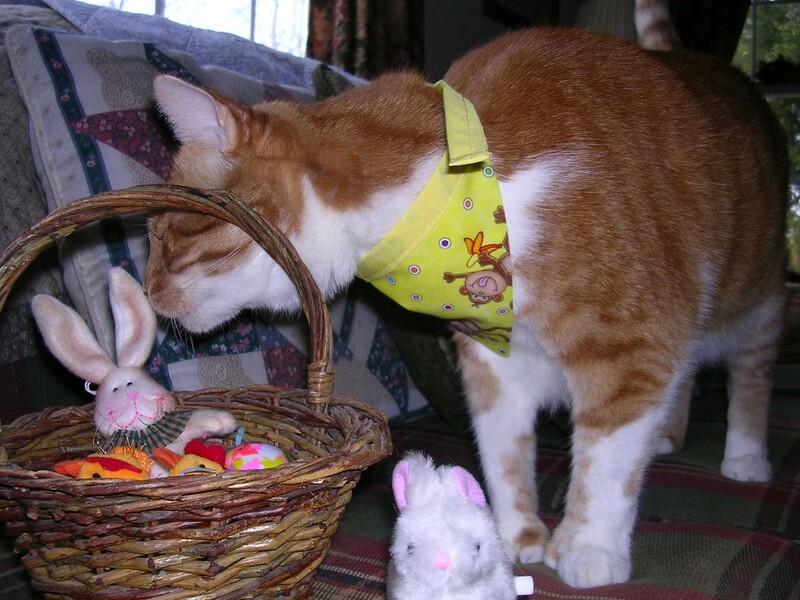 I have other Easter pix of me – some show me with my Easter baskets of the past – some with my Easter scarf on (from Mollie’s Shop) – and while I COULD wear my scarf again, I think I make a rather cute bunnywabbit. If you like Easter competitions, there’s one happening over at My Three Moggies…………you have to submit a picture of you in your “Easter Costume” AND answer some questions about the Moggie boys……….if you feel lucky, give it a whirl because the prizes are from Mollie’s new “Easter Collection”……..! 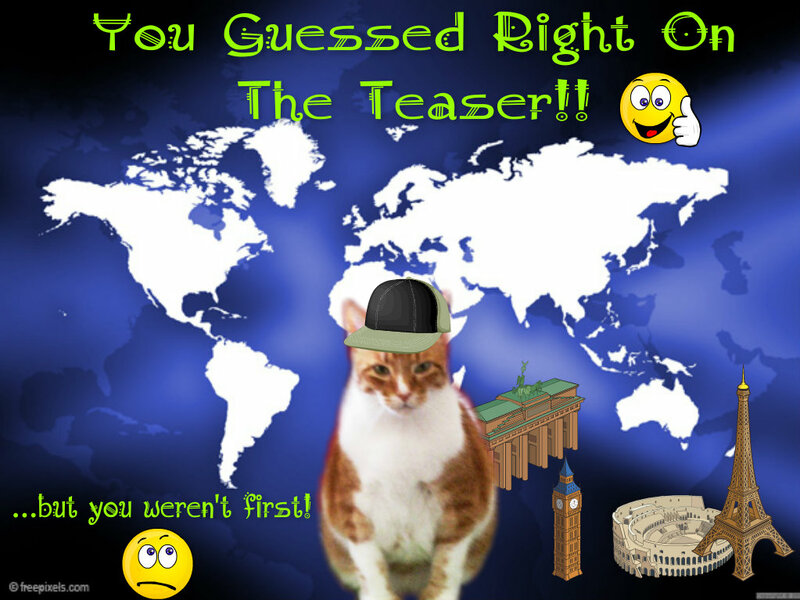 Now on to other things – like TUESDAY TEASER………………….we have a “Guest Teaser” tomorrow. That’s right – a fabulous friend of mine sent me some pix to use and I’m gonna use them tomorrow. I probably will post TWO pix from this spot on Planet Earth for you to guess WHERE………then on the Tell All I’ll show you more pictures from the location……….cool huh? 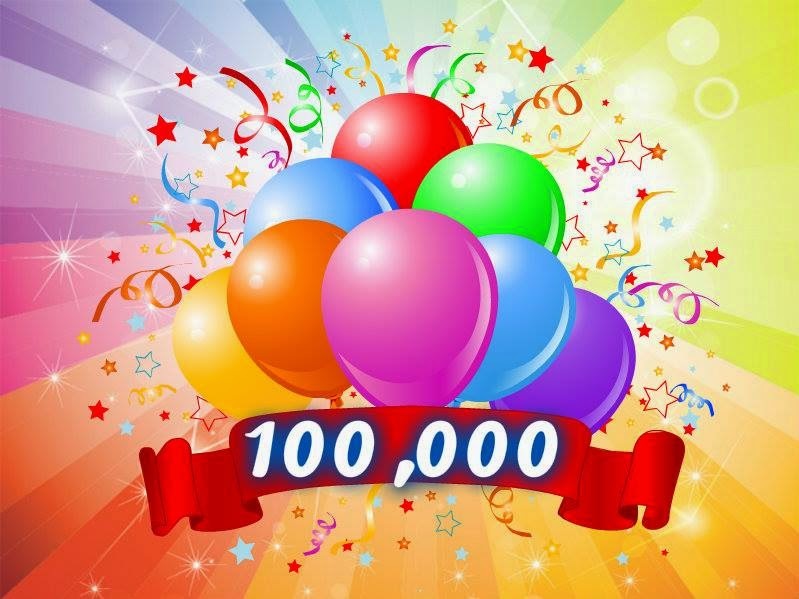 So, remember, you get a special award from ME if you’re first to guess right tomorrow………. 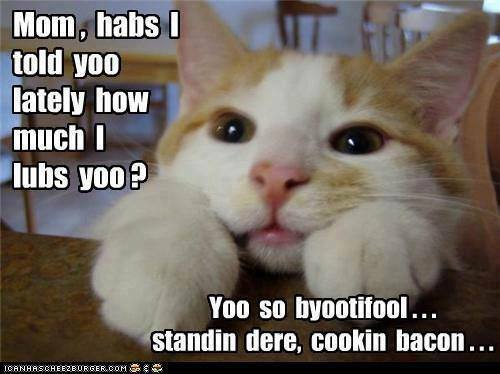 And if you’re clueless (but still adorable since you’re my friend of course)………. 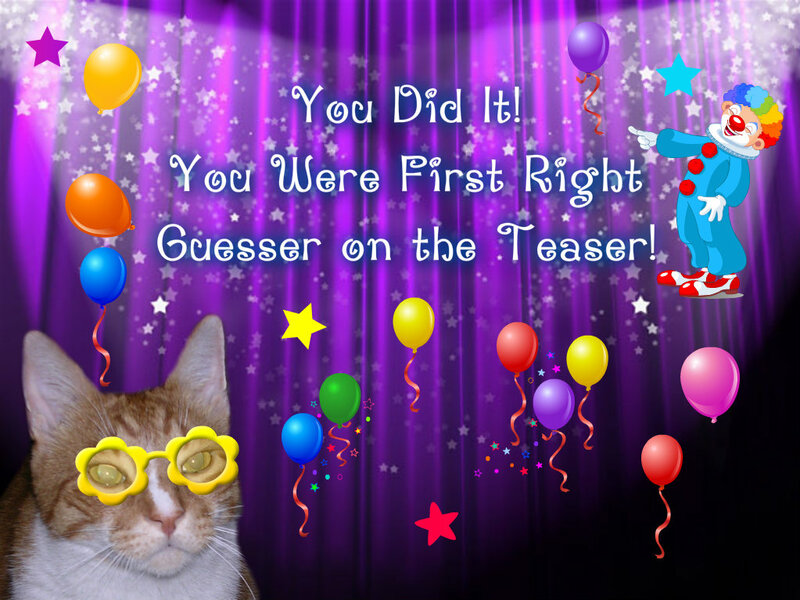 So be here bright and early tomorrow morning (6AM Eastern Standard Time) to give it a shot at getting the FIRST RIGHT GUESSER award…………..you know you want it! BUT WAIT – DON’T GO YET – LAST MINUTE NEWSFLASH – I WAS NOMINATED FOR A NEW AWARD!!!! Nissy has started a lot of new awards around the blogosphere and I figured since I received this yesterday I’d better send it on its’ way ASAP! Post and thank the person nominating you! Visit three of the blogs who received the award along with you when you were nominated! Tell three things you have to celebrate/are thankful for! Pass award to SEVEN bloggers! 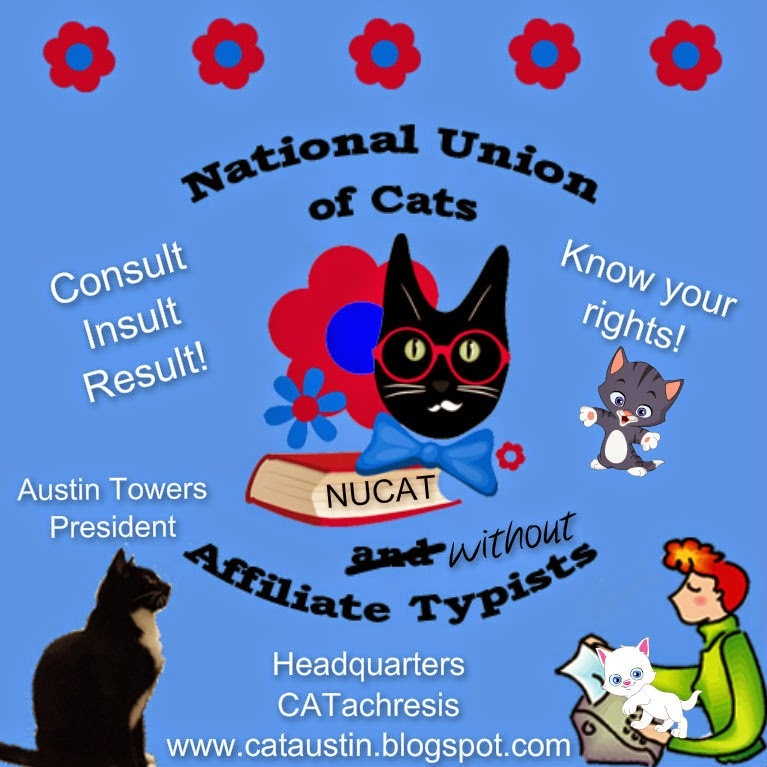 SO, in accordance with the above…………….THANK YOU NISSY – I’m about to visit three of the other blogs you nominated…..